From 1997 until 2006 the duo developed a cult following for their unique brand of folk and roots music. Their zany act which needs to be seen to be believed includes jaw dropping showmanship and instrumental wizardry. They appeared on BBC television on several occasions including Hugh Fearnley-Whittingstall's River Cottage and performed together at a great many events across the west country including several appearances at Glastonbury Festival. 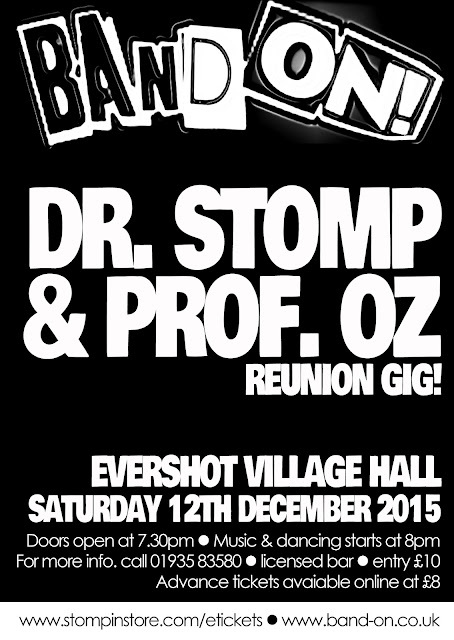 Upon going their separate ways Doctor Stomp rebranded to Stompin' Dave and has performed across the UK and beyond. Dave was nominated for a British Blues Award in the acoustic act category 2014 and was winner of the FOAOTMAD old-time banjo competition 2011 and 2013." Oz has performed in many local bands as well as with some musicians visiting Dorset such as London based bluesman Errol Linton and zydeco act Flaky Jake. Oz the perfect foil to Dave’s exuberance adds backing vocals, guitar, fiddle, and lap steel to Dave’s singing, banjo, guitar, keyboard, fiddle and flatfoot dancing.